Click here and answer a few basic questions and you'll get a response that indicates the religious belief that most closely matches your answers. As you move through the questions, you'll be presented with several ads but you can skip past them by clicking in the upper right corner. 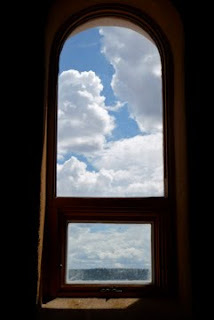 About this image: a window from the Chapel at San Luis, CO. I like the image, especially the effects through each window, close and far away at the same time.